This post is featured in the CAPC Magazine, February 2017: ‘And the Winner Is…’ issue of Christ and Pop Culture Magazine. Subscribe to Christ and Pop Culture Magazine by becoming a member and receive a host of other benefits, too. As a movie-superhero fan, I’ve cheered for the Captain America: Civil War trailers the way some cheer for sports. But one recent trailer made me grin at the sight of an old friend. Yes, but not as awesome as seeing Spider-Man himself, this time appearing in an actual Marvel Cinematic Universe film alongside Captain America, Iron Man, and other popular heroes. Before this, Spider-Man’s film rights were limited to the decent yet over-corporatized Amazing Spider-Man film series, the rebooted storyline with Sony Pictures. But before that, Spider-Man had his original Sony-led film trilogy from 2002 to 2007. Millennial fans don’t just need superhero stories. We specifically need Spider-Man to help us explore what it means to be young heroes who want to change the world. In 2002 I was an ordinary college freshman, feeling a bit shunned because of my homeschool background and my love of stories. The only theater movies I’d seen were Prince of Egypt in 1998 and The Fellowship of the Ring in 2001. I hadn’t cared to see X-Men, likely because of rumors about themes that many interpreted as anti-Christian. Then along came Spider-Man, directed by Sam Raimi and starring Tobey Maguire. Suddenly “geeks” and uncertain homeschoolers alike had a hero to reflect them. Today some fans fault Maguire’s tight-lipped, emotional portrayal of Peter, but it wasn’t fan desperation that pushed the first Spidey series to box-office heights. Here was a genuinely mild-mannered and decent young man, one who respects elders, pines and fights for one woman without hint of lecherous intent, and despite his flaws works to use his new powers responsibly. People I knew commented how, well, homeschooled Peter acted — despite his infatuation with Mary Jane, who was a more worldly version of the traditional distressed damsel. For whatever reasons, the story sneaked past homeschool watchful dragons, and I happily joined other fans awaiting the sequel. For the second time (after The Lord of the Rings) I could join a “secular” fandom, and not out of some rebellious impulse, but out of a genuine desire to enjoy a new story and follow a fantastical hero. In 2004, I eagerly saw Spider-Man 2, in which Peter’s values are challenged by a new villain and his own failures to balance real life with Spider-life. Fans may wish they were Spider-Man, but here Peter would prefer living normally, with a steady job and girlfriend. Today some fans roll their eyes at a Spider-Man who doesn’t want to be Spider-Man, but such a theme pushed Spider-Man 2 beyond simplistic wish fulfillment. The first film’s theme was “With great power comes great responsibility,” and Peter at the sequel’s end voices a new wisdom: “Sometimes to do what’s right, we have to be steady and give up the thing we want the most. Even our dreams.” Even today I wonder how this truth has affected my life. The new story wasn’t instantly iconic to me like “old” Spider-Man. But overall it worked. I liked Garfield’s enhanced New York-y spin on Spidey, his classic homemade webshooters (the first movie Spider-Man fired organic web directly from his actual hands), and that old thrill of Spidey discovering his powers and going through moral puberty all over again. Still, the movie leaned heavily on Screenwriting 101 tropes that the original series wisely avoided, such as high-school romance, “chosen one” themes, and biological father issues (fans rightly complained Uncle Ben is Peter’s real father figure). Another lingering problem got even worse in Amazing Spider-Man 2 (2014): the corporate flavor. Sony wanted Spidey to have his own cinematic universe, and in that universe all the TVs, laptops, cameras, and phones are made by Sony. By comparison, Raimi’s original films — special-effects action shots and Dr. Pepper product placements and all — felt almost independent. Ultimately the second Spidey film series suffered, just like the first, because of its success. The first Spider-Man trilogy created the modern superhero franchise boom and the “shared cinematic universe” idea, popularized by Marvel Studios proper, which did not own Spidey but owned other superheroes like Iron Man, Thor, and Captain America. Now it seemed too late to revert to the old way of films about a single, separated Marvel hero and his family, friends, and villains. One hero, not even Spider-Man, couldn’t hold the weight of fan expectations and Sony’s requirement of sequel setups, demographic-pleasing, and shallow villain stories that made ASM2 feel even more overstuffed than the similarly criticized Spider-Man 3. Online, fans began complaining, half-jokingly and half-seriously: “Give the rights back to Marvel.” Meaning: “Sony, stop hogging Spider-Man for your own corporate interests and let Spidey make movies with other heroes in the Marvel Cinematic Universe for our fan interests.” At first such a notion seemed impossible. Why would Sony give up their hero? It would take, say, a S.H.I.E.L.D.-level plot of espionage, hacking, and North Korea to do it. Which is exactly what happened. Then, in February 2015, the two studios teamed up. Now the third version of Spider-Man, this time played by actual high-school student and gymnast Tom Holland, has arrived in Captain America’s movie. For many fans, the impossible has come true: in Captain America: Civil War, Spider-Man really does team up with other heroes. Light spoilers here: Peter Parker is recruited from amateur street hero status directly into the big league by none other than Tony Stark. Once in play with an upgraded suit, Spider-Man, at least to me, pretty much takes over the story. For the non-climactic airport scene, the “fun” battle, I spent most time tracking Spider-Man. He quips, he thwips; he joyfully confronts and rightfully loses to Captain America; he takes on Winter Soldier and he takes down Ant-Man. He is almost a distraction, one piece of superhero eye candy too many. Clearly they worked his scenes into the film and even digitally added Spidey into that shot you’ve seen in the trailers of all the heroes running at each other. The final end-credits tease “Spider-Man will return.” I started a round of applause; the theater burst into cheers and whoops. Fans rejoiced. Welcome back, Spidey! Spider-Man will re-debut in 2017’s Spider-Man: Homecoming, joined by none other than MCU golden boy Tony Stark. In either of the films, Spidey won’t be limited to characters like Aunt May or more Goblins. He’ll have many more super-friends to as enemies or allies. Perhaps even better, now that other heroes are free to have things like spies, magic blood, or father issues, Peter can be his own person, with limits, inexperience, and that all-important average-teenager background. Perhaps he could learn great-power lessons from Captain America, or even Tony Stark. Even better, Spider-Man can become a hero who shares stories that encourage younger and awkward fans like me. We might like to build our own robotic suits, save America, or wield a magic hammer and summon rainbow-bridge teleports to Asgard. But in real life we are much more like Spider-Man: young, flawed, and uncertain about power and responsibility. Millennial fans don’t just need superhero stories. We specifically need Spider-Man to help us explore what it means to be young heroes who want to change the world, fight for true justice, be faithful friends, and always remember to bring home eggs to Aunt May. 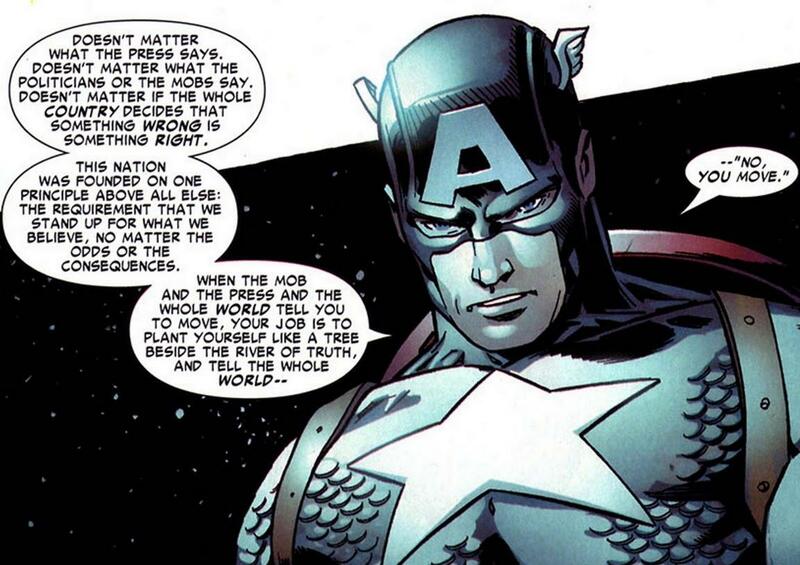 Iron Man can explore man vs. machine; Captain America can explore patriotism in a complex world. But imagine a new Spider-Man who explores individual-level challenges blown up to superhero size, asking for us: What if I have great power (yes! and I want to help change the world) paired with responsibility (but I am required to make hard and moral choices)? Apart from moral, even biblical themes, I want to feel the amazing in Spider-Man. There’s a time for serious superheroes, but also a time for fast webslinging, quick quips, villain beatdowns — not to mention the unrestrained joys of being able to toss web, lift cars, and stick to walls. It appears that this Spidey — now that he has amazing friends — will stick around for years to come.